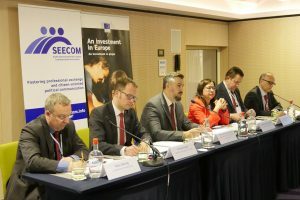 A round table discussion on the EU enlargement policy and the European future of the Western Balkans, with a focus on the importance of communication, was organized by SEECOM, in partnership with the European Commission’s Directorate-General for Neighbourhood and Enlargement Negotiations (DG NEAR) in Brussels on 31 March 2017. The speakers included Aleksandar Andrija Pejović, Minister of European Affairs of Montenegro, Genoveva Ruiz Calavera, Director for the Western Balkans, Directorate-General for Neighbourhood and Enlargement Negotiations, European Commission, Claus Giering, Head of Unit, Inter-institutional relations and Communication, Directorate-General for Neighbourhood and Enlargement Negotiations, European Commission, Ognian Zlatev, SEECOM Chairman, Head of the EC Representation in Bulgaria, Christian Spahr, SEECOM Board Member and Director Media Program South East Europe, Konrad-Adenauer-Stiftung. The discussion was moderated by Dušan Reljić, Head of the Brussels Office of the German Institute for International and Security Affairs (SWP). The discussion produced the following conclusions. m, populism and fake news. Consequently, public support for the enlargement policy within the European Union remained at a low level over the past years. The average opposition rate in EU countries stands at 51%, while as many as 65% of French citizens, 68% of Germans or even 71% of Austrians are against any further enlargement of the Union. The EU citizens’ key concern about further enlargement is not to import problems of the enlargement countries. Negative public sentiments towards enlargement are also nurtured by predominantly negative headlines about the enlargement region in the Western media. The reputation and attractiveness of the EU in the Western Balkans has suffered as well. Contributing to this are the region’s generally slow pace of EU accession and the anti-European narratives fuelled by a renewed geopolitical interests of ‘third parties’ in the Western Balkans. Furthermore, as the EU’s agenda is dominated by a growing number of c omplex internal issues, there is a perception in the local societies that the EU has abandoned the region and that its European perspective is not that clear. There is an evident problem of misperception when it comes to the benefits and effects of the EU accession process for the societies of the Western Balkans. In some countries, Russia is wrongly perceived as a bigger donor than the EU, whereas the reality is quite the opposite. A major challenge in raising public awareness of the EU’s financial support for the Western Balkans is that the pre-accession funds are predominantly used for capacity building, rather than for specific projects that speak more directly to the people, such as news roads, schools or hospitals. This leads to another major challenge of managing people’s expectations when communicating EU enlargement. There is also a crisis of trust in some of the key local advocates of the European future of the Western Balkans. According to Eurobarometer, trust in political parties is very low throughout the region, while a majority of citizens in half of the Western Balkan countries believe that their countries will never join the EU. On the other hand, fake news has found fertile ground in the Western Balkans, as many media outlets in the region have been reduced to ‘PR machines’ serving the interests of media owners. There is a solid political support for the enlargement policy and a clear EU perspective for the Western Balkans, as reaffirmed by European leaders at the recent summits in Brussels and Rome and echoed by the EU institutions. There seems to be a growing realisation in the EU that the Western Balkans, as ‘the soft belly of Europe’, can hardly resist the mounting, external and internal, anti-European pressures on its own. The forthcoming Bulgarian Presidency of the EU is an important opportunity for communicating the importance of EU enlargement for Europe as a whole. A clear prospect of EU membership and a good pace of the EU accession process are a powerful motivator for reforms in enlargement countries. There is also clear evidence that the EU-oriented reforms are bringing concrete benefits to citizens and improving the quality of life in the Western Balkans. Over the past decade of their EU accession efforts, certain EU candidate countries have seen quite remarkable improvements in people’s living standards, such as the doubling of average salaries and pensions, visa-free travel for all citizens, numerous study and research opportunities in the EU for their students, teachers and scientists and extensive access to EU expertise and funding for their farmers. 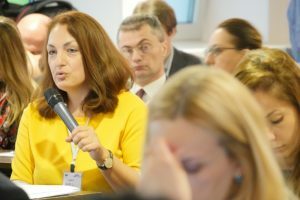 The Berlin Process, as a major EU-led investment drive that brings concrete benefits to the citizens of the Western Balkans and physically connects the region with the rest of Europe, has a huge potential for public communications. There are many untapped opportunities to use the key infrastructure development projects for demonstrating to the citizens the tangible benefits of a united Europe. The level of awareness of EU support is generally higher in the Western Balkans than that in the EU, as more people are aware that the EU is providing financial support in their area in the enlargement countries than in the EU member states. Since the European cultural identity is deeply rooted in the Western Balkan societies, cultural diplomacy is an important, yet underused, tool for strategic communications about the EU enlargement policy. Political voices of a united Europe, both in EU member states and in enlargement countries, should be much louder and much more engaging in order to cut through the noise of populism and fake news. EU Institutions, governments, CSOs and media need to join forces to communicate the European future of the Western Balkans together, in the EU and in the region. Explaining the importance of EU enlargement to citizens should be a civic education effort, not a PR exercise. Pro-active communication of national authorities is pivotal to show benefits of EU enlargement to people in the EU and in the Western Balkans. 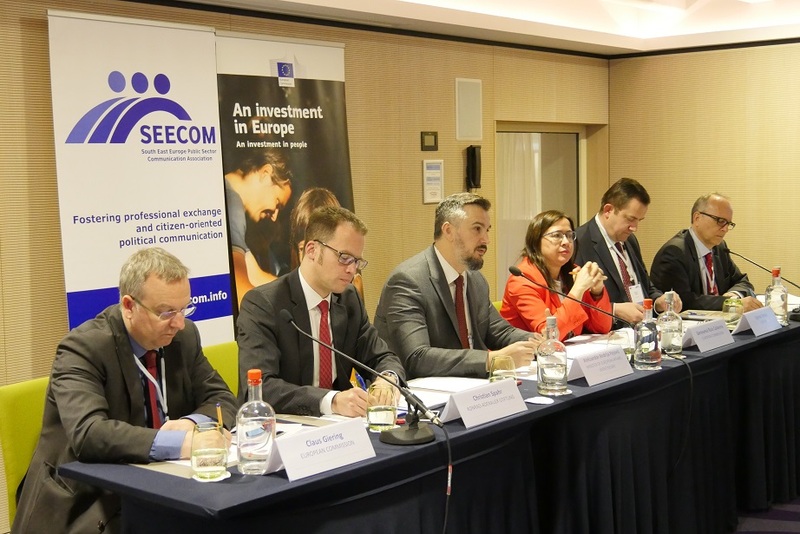 There is a pressing need to invest in building the public communications capabilities of the enlargement countries, in order to provide them with more effective strategies, tools and resources for communicating the importance of EU enlargement at home and abroad. However, capacity building efforts alone will not suffice and the existence of genuine political will is still an absolute precondition for effective public communications about the European future of the Western Balkans. The best way to address the skepticism of EU citizens is to ensure that enlargement countries are well-prepared to meet EU membership commitments. Therefore, an important message to EU citizens is that the enlargement countries are not asking Europe to turn a blind eye to their weaknesses and that no country wants to join the EU before it is ready to meet all the commitments. Instead, what the Western Balkans needs, at this stage of the enlargement process, is a clear perspective of its European future and a fair merit-based accession process. The enlargement region, therefore, needs the EU’s help and the support of citizens to fully embrace EU values and rules and unlock its full potential for the good of all Europe. On the other hand, the EU too needs a more comprehensive and more in-depth strategy on how to communicate enlargement to its own citizens. This strategy needs to cater for growing interests of ‘external factors’ in the region, but the scare of negative external influences must not be the dominant communication approach. Instead, benefits of EU enlargement for the whole Europe need to be in the focus of communications. Again, this needs to be a collective effort involving national authorities, EU institutions, civil society and media. EU values, goals and processes are widely unclear to citizens, which is why the EU should focus on appearing as a reliable partner to Western Balkan countries and inspire sense of security through close dialogue with local societies and communities. There is a clear need to empower journalists and invest in improving media standards in the Western Balkans, as only high-quality media can be a reliable and credible partner in explaining the importance of EU enlargement to peoples in the region. Likewise, more coordinated and sustained efforts are needed to make the case for EU enlargement and place pro-enlargement narratives in the Western media.